How politics in America works today, how it got that way, and how it’s likely to change through reform—these are the themes that pervade every chapter of Cal Jillson’s highly lauded American Government: Political Development and Institutional Change. America’s past is present in all aspects of the contemporary political system. Jillson uses political development and the dynamics of change as a thematic tool to help students understand how politics works now—and how institutions, participation, and policies have evolved over time to produce this political environment. In addition, Jillson helps students think critically about how American democracy might evolve further, focusing in every chapter on reform and further change. Highlights the 2016 Presidential and Congressional campaigns and elections. Projects the likely legacy of Barack Obama’s presidency. Includes important Supreme Court events and decisions including the death of Justice Antonin Scalia and the affirmation of gay marriage. Covers the continuing challenges of and to the Affordable Care Act. Presents new material on race, ethnicity, gender, and political participation. Explores growing income inequality and its implications. Pays increased attention to social media and new media in politics. Updates all data in tables and figures through the 2016 elections. Offers the most compact yet comprehensive text package available. Key Focus Questions at the beginning of every chapter prepare students for the major points to be covered. "The Constitution Today" chapter-opening vignettes illustrate the importance of conflicting views on constitutional principles. Key terms are defined in the margins on the page where they appear, helping students understand important concepts in context. Colorful figures and tables enable students to visualize important information. "Struggling towards Democracy" features provoke critical thinking through examining the "then and now" of democracy in America. "Let’s Compare" boxes analyze how functions of government and political participation work in other countries—now framed by new critical thinking questions. "Pro & Con" boxes bring to life a central debate in each chapter and highlight competing perspectives; new discussion questions in each box prompt students to consider the different arguments and weigh in. End-of-chapter summaries, suggested readings, and web resources help students master the material and guide them to further critical investigation of important concepts and topics. 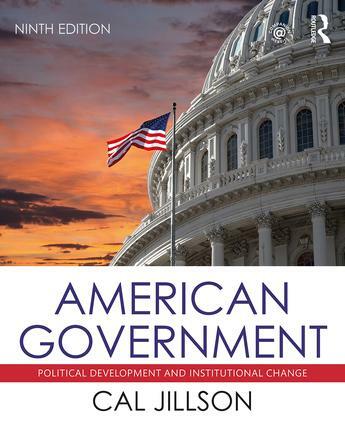 This terrific textbook will help students get to the bottom of the mysteries of the American government and why it has been so difficult for Americans to work together for the common good. Cal Jillson expertly shows us how our past shapes our current political path, from Black Lives Matter to the legalization of marijuana, voter ID, mass shootings, and the historic election of 2016. Most of my students are non-majors. They walk into the course expecting to be bored. Jillson’s text helps them get over that. They find exciting things in U.S. political history including the Federalist debates, Marbury v. Madison, and the expansion of federal power through executive action and judicial interpretation. They also learn how the contemporary system works. I've considered many textbooks over the years and this is clearly the right one for me. Clear, comprehensive, and concise, this is no doubt the best American government text on the market today. This book truly stands apart from the vast crowd of introductory American politics textbooks. A book that connects the political challenges of today to the political conflicts of the past. The ideals that Jillson so thoroughly includes in this text are straight down the middle and do not in any way cater to the right or left, which is a refreshing idea in today’s educational world. An A+ for government classes everywhere! Cal Jillson is Professor in the Department of Political Science at Southern Methodist University. His recent books include Lone Star Tarnished: A Critical Look at Texas Politics and Public Policy; Texas Politics: Governing the Lone Star State; Pursuing the American Dream: Opportunity and Exclusion Over Four Centuries; Pathways to Democracy: The Political Economy of Democratic Transitions; and The Dynamics of American Politics. Jillson is a frequent media commentator on Texas and national politics. Temporary access to instructor resources are on the Download Hub. A full CW is planned for both Students and Instructors.